Community monitoring of fishing 2.0 ! 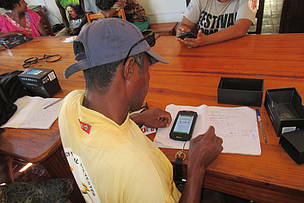 Fishers in Southwestern Madagascar are putting themselves to new technologies! Fifteen men and women from communities that manage marine coastal area in Mahafaly were trained on the use of collection and monitoring catches tool. WWF has equipped these people with waterproof smartphones that can collect data on the changes in catches in the fishing areas in the Southern of Anakao. This training also consists on getting familiar with the "Survey 123" mobile application to facilitate monitoring of fishing catches. Raharisoa Célestine is a mother in Maromena village. "It was an opportunity to learn how to use an innovative tool in order to manage my work as a datalogger. It is also a chance to share what I have Iearned to develop my community," she says. This technological advancement helps in coral reefs conservation. Not only allow these monitorings for the identification of the state of the marine ecosystem, but also the income of these fishers, as well as the effectiveness of marine resource management. "Thanks to this technological tool, the collected data will be sent in real time to the WWF team to facilitate decisions on the coral reefs status. At the same time, they are directly transmitted to the Ministry of Fisheries database", says Lalaina Rakotonaivo from WWF. Now, fishers can predict the closure of temporary stocks of octopus according to the stock fished during the year. They will also can know which species of fish are more fished than others and adapt their activity to avoid the drain of fish in their reefs.